Woodworker's Journal Magazine features page after page of great sort after projects, patterns and drawings that eliminate guesswork. Step-by-step instructions and full-size patterns are valuable for beginners and veteran woodworkers alike, and you'll stay up-to-date on the latest equipment and products with it's shop tests and tool reviews. 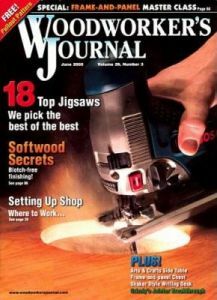 The tips and techniques featured in every issue of Woodworkers Journal magazine will help enhance your skills.